Intelligent Content: A Primer shows you why you should know about intelligent content, opens the door to new ways of thinking about your content, and gets you started down the road to using intelligent content to gain a competitive advantage. 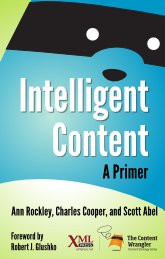 Intelligent Content: A Primer is now available in print and Kindle form from Amazon.com and most Amazon sites worldwide. It is also now available from Barnes and Noble. The ebook version can also be purchased from O’Reilly Media and other retailers worldwide.